A Surprising Land of Beauty and Old World Charm. Portugal is unfairly overlooked, an advantage for savvy travelers. Portugal’s huge colonial empire from Asia to Brasil brought great wealth to this small land. These riches await in amazing palaces, huge monasteries, castles, cuisine and one of Europe’s oldest universities. The charms of Lisbon and Porto plus the arts, fashion and fine wines and truly kind locals make seafaring Portugal a destination to remember. Some say Portugal is the last of the Old World, a country unjustly overlooked by the travel media. Our past customers since 1998, agree that Portugal is a hidden gem, and one of Europe’s most beautiful and intriguing countries. So make no mistake, Portugal, offers a plethora of rewarding experiences, memorable people and unique memories for upscale travelers who go know where and when to find it. To experience the best of Portugal is a bit like pealing an onion as there are many subtle layers in this gentile old world country. huge monasteries, powerful fortresses and one of Europe’s first universities. Portugal is very oriented toward the sea, as you are never more than a few hours from the Atlantic. This ocean access and historic navigators like Magellan and Vasco de Gama led Portugal to become a 16th century world trade power. Yet modern innovation also is evident in Lisbon and Porto in the arts, fashion and upscale restaurant scene. Foodies will also enjoy discovering ancient yet modern wine making of the Douro Valley, Porto and Alentejo. Wine touring in Portugal combines well with picturesque country roads leading to sun drenched medieval villages where widows still where black in a time-honored custom of mourning until death. The lush valleys and forest of northern Portugal are a vivid contrast to its jagged southern coastline, the Algarve, is a land of cliffs, coves, and beaches. In south and central of Portugal like in Spain expect abundant historic towns with medieval castles, groves of olive, oranges, cork oak and vines. An early Spring is common in Portugal with dazzling flowers all over. Expect an often quieter and even slightly British air compared to the Spanish. Some say discovering the subtle charms of Portugal is like getting to know a sophisticated intelligent, beautiful yet reserved woman. So it helps to have a savvy host who knows how to open the right doors. Outside of the cities of Lisbon, Coimbra and Porto will notice Portugal’s landscape blends an amazing variety in a compact country, from a dramatic coastline to green mountainous interior. Celtic, Moorish and Roman influences are evident on the ground, the people, and their language. A country oriented to their long Atlantic coastline with a gentile style awaits. Contact us today to start your insider’s Portugal adventure. More on the History of Portugal: Portugal’s roller coaster history has centered on their sailing and navigation skills that led to a far flung colonial empire. But way before that, what is now Portugal was part of the western border of the Roman empire for some 500 years. After a break, the Arab Moors moved in for over 5 centuries. Portugal’s borders were largely set out in the 13th century when a Christian reconquest with a big assist from the enigmatic Templar Knights was completed. Portugal then turned outward toward the Atlantic and began a great age of exploration and empire-building. In fact some believe that Christopher Columbus learned much of his advanced navigation skills here where he spent some 10 years before moving next door to seek “venture capital” for his little expedition. Portugal could have signed him since he was a free agent but they dropped the ball which fell into Spain’s hands. Portuguese navigators have long been held in high regards and Portugal developed sea routes to east Asia, south Africa, India, and Brazil. They became the leading European traders with Asia after arriving to Japan in 1540. The high point of the age of exploration was during the 15th century under Prince Henry the Navigator. But the next 300 or so years saw royal and economic instability. This included poor economic administration, wasteful spending by the nobility, natural disasters, and invasion of Spain and later Napoleon. After two national bankruptcies, a nationalistic dictatorship found support to seize power and finally restore order in the 20th century. The dictatorship kept Portugal out of World War II. This regime under lasted more than 40 years, until a near-bloodless coup established democracy in 1974. Unlike many modern perfectly organized northern Europeans cities, Lisbon, like Rome and Madrid is at once hard to navigate but easy to fall in love with. A city built on seven hills and facing toward the Atlantic, Lisbon is at once part of modern Europe but without having lost it’s own sense of character. Discerning travelers will often enjoy these subtle and endearing old world qualities of Lisbon. Some of these qualities seem rooted in a more innocent carefree age of the 1920s like wooden street cars that somehow climb up extraordinary inclines, Art Nouveau cafes, mosaics on plazas, the medieval Alfama quarter still guarded by the St Jorge Castle. One can see the progress and investments of the many millions of Euros invested in infrastructure before the economy went south and politicians grew the government to a size that they perhaps needed to govern a world empire . Today in Lisbon the once rapid pace of new projects has slowed but a vibrant yet relaxed cosmopolitan ambiance remains. The Great Earthquake of 1755 and a huge fire, destroyed many of Lisbon’s 16th century buildings. One of Portugal most polemical and powerful figures then rose to power to lead the major reconstruction. Sebastiao José de Carvalho e Melo, the Marques de Pombal, organized the rebuilding and reorganization of Lisbon. This led to many impressive new civil and religious edifices and palaces. Lisbon’s unique street grid pattern of the Marques de Pombal still covers the Lisbon hills. He also largely shut down the Inquisition of Portugal. Among the few major sites of Lisbon’s golden age to survive the 1755 Earthquake are: the Monastery of Jerónimos at Belém and the Castelo de São Jorge with dazzling views over the capital. Modern landmark sights include the unique architecture and art of the Gulbenkian museum (Fundação Calouste Gulbenkian), with a outstanding collections of ancient and modern art. The Gulbenkian is regarded by many as one of Europe’s top collections of art and applied art, ancient to Lalique. For modern nightlife the Bairro Alto is chock-full of stylish bars, restaurants and clubs. Porto (Oporto) – In beautiful river and coastal wine city of Porto, a cobbled mix of steep alleys and passages seems to have changed little in centuries. The second-largest city of Portugal, Porto is also the northern capital. The charm of the city includes the Port wineries, river cruises up the Douro to an area of fine red wine production and the contrast between the stylish modern core and the more earthy charm of its riverfront Ribeira area. Along with the Rio Douro “coast” is the nearby Atlantic ocean coastline that has a bit of a California feel. This area includes a trendy upscale area of bars and fine dining in beachfront restaurants with a most memorable western views of the sunset fading into the Atlantic waters. 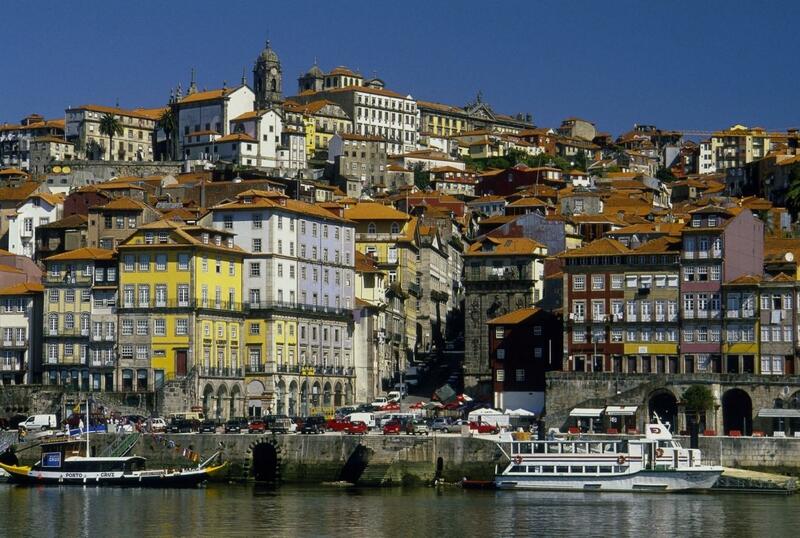 Porto is well worth a couple of days of the time of a sophisticated fun loving traveler. Sintra -Those who love romantic beauty should not miss this hilltop wonderland of mansions, opulent palaces and country estates. Sintra sits on granite slopes over forested ravines and with many fresh water springs. This beauty made it a favorite summer retreat for the nobility, bankers and politicians from Lisbon during the long summers. It is now on listed on the world heritage list of UNESCO. Algarve coastline – Enjoy grottoes, beaches and wildly shaped rocks by boat from the historic Algarve port of Lagos. Monsanto – An ancient settlement built on a defensive high hill that almost seems to grow out of the very rocks it’s built upon. Seeing the sunset with a glass of regional wine and cheese is a sublime moment for many. The Dinosaur trail (Pegadas dos Dinossaurios) – Natural history minded kids and adults love this 175-million-year-old sauropod tracks in central Portugal. A great train ride of Portugal – The Corgo train line winds around amazing gorges from Peso da Regua then on to Vila Real. For monastery lovers: Tibaes – One of the oldest monasteries in Portugal, it is also one of the most atmospheric buildings in the country and includes number of medieval tales. Royal tombs of Alcobaca – The sculpted tombs of Dom Pedro and Inês de Castro dominate this glorious twelfth-century Cistercian monastery. Palacio Nacional de Mafra – An example of why Portugal lost their position as a world power, this gigantic palace / convent nearly bankrupted the country when it was built in the 18th century. Be glad you are not on the cleaning crew as it has some 2500 windows and 4000 doors. Bird lovers escape to Berlenga Island – An Atlantic bird-sanctuary island for a change of pace. Briteiros Celtic Fort – Step back to pre-Roman times at the magnificent Celtic hill fort near Braga. Bom Jesus do Monte – Possibly Portugal’s most picturesque church, it has a memorable grand ornamental stairway. This is for many the most amazing spiritual sanctuary of Portugal. The lower section includes the 14 Stations of The Cross with many life-sized statues. Monsaraz – The medieval fortified hilltop village of Monsaraz sits above the Guadian river that flows in from Spain. Monsaraz offers an atmospheric change from the urban energy of Lisbon or Porto. It has a dramatic history as over the centuries as was often a strategic border town changing hands from the Moors, to the Templar Knights, to the British, the Spanish, the Portuguese again, Napoleon´s French army and then finally back to Portugal. Barcelos Fair – A very colorful market full of rural traditions and good spirits. Obidos – Post-card-pretty medieval town that used to be the traditional bridal gift of the kings of Portugal. Obidos sits on a hilltop and offers pretty white washed houses. The setting is made even more dramatic as Obidod is still surround by her 14th century crenellated walls. Be sure to visit the former Moorish castle taken in 1148 that is now a historic pousada hotel. Convent of Christ in Tomar is one of the former headquarters of the Knights Templars who were a key part of the creation of Portugal by helping push out the Moors. Contemporary Art Center of Porto – Situated in a wonderful building refitted by on of Portugal’s leading architects, Álvaro Sizza Vieira. Guimaraes – Framed by rolling hills, Guimaraes was proclaimed by king Alfonso Henriques to be the original capital of medieval Portugal. A place of charming ambiance, Guimaraes offers a well preserved old town, with medieval castle, cobbled streets and many historic buildings. There is a well done medieval festival held in Guimaraes that we can include in our private guided Spain and Portugal foodie adventures. Conimbriga – As part of Hispania (Roman Iberia) for near 5 centuries, this site with vivid mosaics is a must for those who enjoy visiting Roman empire sites around Europe. It is the largest and best preserved Roman excavation of Portugal. Conimbriga, Portugal combine well with Merida, Spain for those who are fascinated by the deep Roman heritage of Iberia.